In Enterprise edition, you can subscribe to a dashboard in report form. You can also adjust your report settings. Use the following procedure to change your subscription and report settings for a specific dashboard. First, open a dashboard that is shared with you, or a dashboard that you own or co-own. Choose the Reports icon at top right. 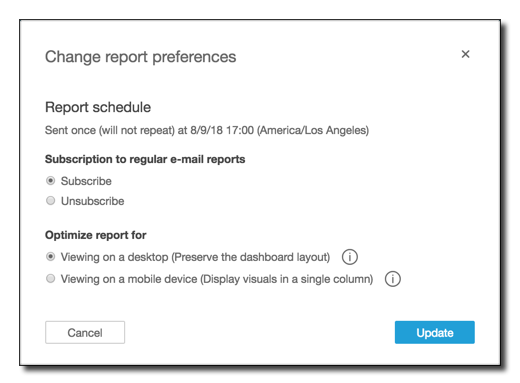 The Change report preferences screen appears. This screen shows the current report schedule, in addition to the subscription and optimization options. For Subscription, choose Subscribe to start receiving reports, or Unsubscribe to stop receiving reports. Under Optimize, choose the device you prefer to view the report on. If you usually use a mobile device or you prefer to view reports in a portrait format, choose Viewing on a mobile device. When you receive the report, the visuals display in a single vertical column. If you usually use a desktop or you prefer to view reports in a landscape format, choose Viewing on a desktop. When you receive the report, the visuals display in the same layout shown in your dashboard on your desktop. Choose Update to confirm your choices, or choose Cancel to discard your changes.